On August 21, the City of St. John’s joined in the celebrations as the Gould Recreation Association recognized an important sports achievement for the neighbourhood. This year, the City converted an under-utilized soccer pitch to a softball field to increase capacity and address the current demand for softball in the community. Goulds community has a rich 40-year history and continued dedication to softball that the repurposed Eric William’s Soccer Pitch supports. The Goulds softball program has participants of all ages, many whom have competed at national and world competitions. Interest in this sport continues to grow; in fact, many seniors are still participating in the adult league. Of course, there’s still lots of room for soccer in the Goulds. In fact, the Alf Sullivan Soccer Pitch, constructed in 2009 is capable of accommodating national level events and is the premiere soccer pitch in the west end of the City. It has been formatted to allow minor level cross field play and full field matches and is outfitted with players and officials benches, infield irrigation and surrounded by a 2.5 metre chain link fence. With the continued interest in softball and the challenges associated with trying to accommodate the demands for field time, the addition of this field will address the growth and create more community involvement at all ages. 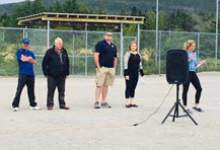 Converting the Eric Williams Soccer Field into a softball field was a partnership project between the City of St. John’s and the Goulds Lions Club, who cost-shared the $100,000 project and is an excellent example of communities – and partnerships – in action!